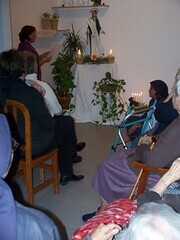 On December 8th, the community of Servant Sisters of the Home of the Mother of Priego held a celebration in honor of the Immaculate Virgin in which the residents of our elderly home participated, along with some other women who joined the event. The youngest of our "grandmas" present was no more than 84 years old and the oldest only 107 years old. By the way, she is one of the most lively and showed it with applause, cheers and poems to Our Lady. The event was defined by the following trinomial: prayer, songs and fun. The first part was dedicated to honor Our Immaculate Mother. Just as the Holy Father went that day to the Spanish Plaza in Rome to honor her, in our home for the elderly, we also adorned her with a sash that read: "I am the Immaculate Conception", and a crown of stars. 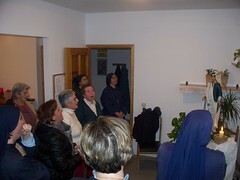 Between the prayers, we projected a power point on the wall with images, music and big words so that the elderly women could follow it. 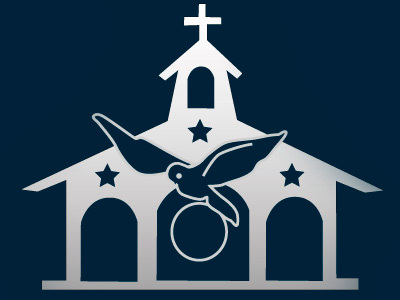 The third part was varied: a trivia game to see if they had understood the small exposition on the Immaculate Conception, a very special version of Bingo in which, separated by teams, they had to overcome trials and questions and win symbolic food items for small baskets that we had given to them. The goal was to obtain the greatest amount of food for the poor. Lastly, our celebration finished with a snack. Our Lady seemed to be very happy there, but we were even happier than her, if that's possible, for having been unworthily invited to her celebration. Thank you so much, Immaculate Mother! And may we do it again next year!